There’s something about biting grilled meat and veggies off a stick that just screams summertime grilling to me. It’s one of those grilled meals you can’t go wrong with. While almost anything goes on a kabob stick, I like to keep it as simple as possible. I always grill my meat or seafood on separate sticks from the veggies, because the grilling times can be different. At my shop, our marinated kabobs are always a popular item in the summer. 1) Cut the pork ribeye or chicken breast into 1¼-inch cubes. 2) Place a gallon sized plastic bag in a medium sized bowl. 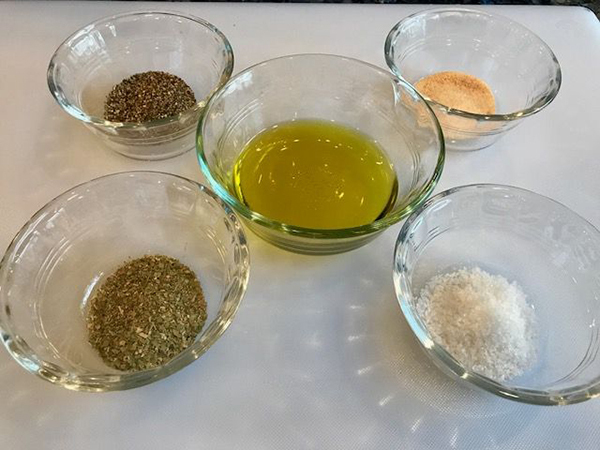 Add the oil, salt, pepper, garlic, and oregano and mix together. Add your meat. Press the air out of the bag and seal tightly. Turn the bag a few times to distribute the marinade. Leave it in the bowl and refrigerate for 2-4 hours, turning occasionally. 3) Remove the meat from the bag and discard the marinade. 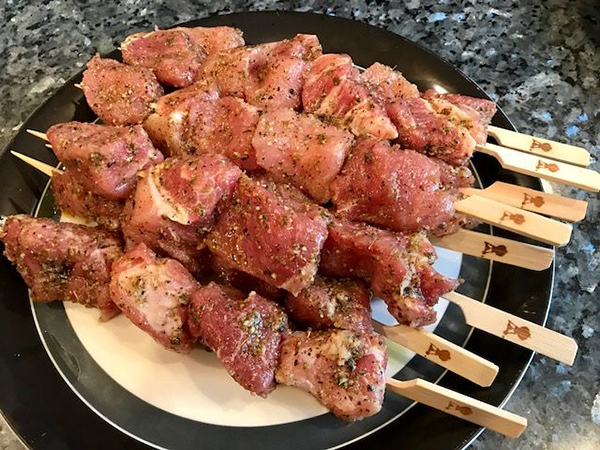 Place meat cubes on skewers, about 4-6 pieces per stick. 4) Prepare the grill for direct grilling over medium heat (350-450 degrees) and allow it to preheat for 10-15 minutes. Brush the cooking grate clean. 5) Grill the Kabobs over direct medium heat turning once or twice. Keep the lid closed as much as possible. 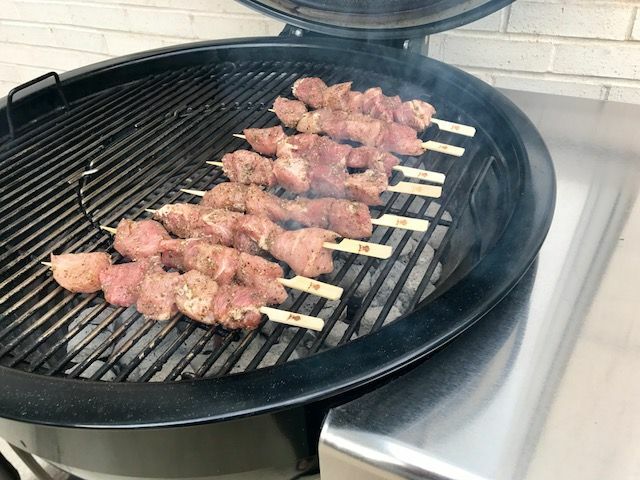 Using an instant read thermometer, grill the Kabobs until the internal temperature reaches 165 degrees for the chicken, 145 degrees for the pork. 6) Remove the Kabobs from the grill and allow them to rest. 7) Cut the lemon in half and grill direct with the lid open for 2 minutes. 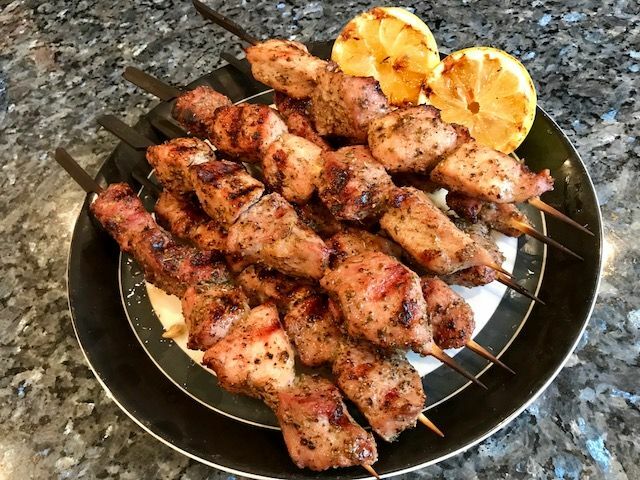 Remove from the grill and squeeze over the Kabobs. Simple, right? ?